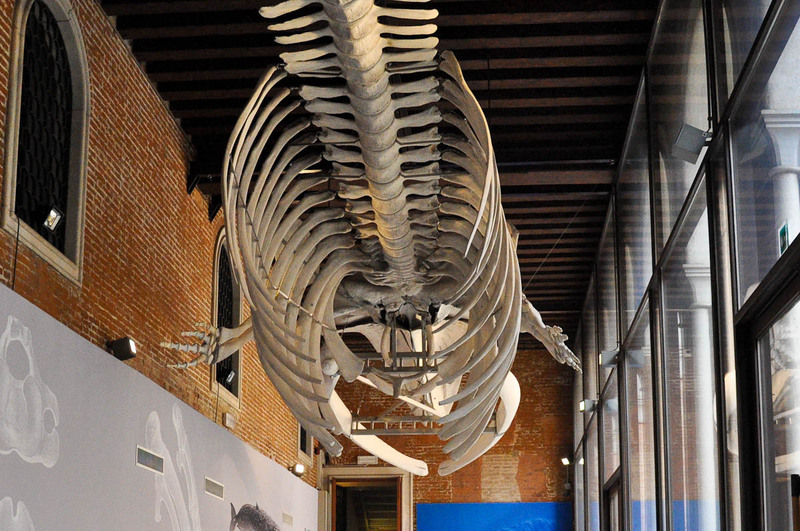 If you are visiting Venice for a day, its Natural History Museum may stay well off your radar. After all it is away from the main tourist area and it is easy to overlook it in favour of such lavish affairs like the Doge’s Palace and St. Mark’s Basilica. If, on the other hand, you are planning to spend a little longer in the city on water, you may want to set aside an hour or two to explore this little gem. 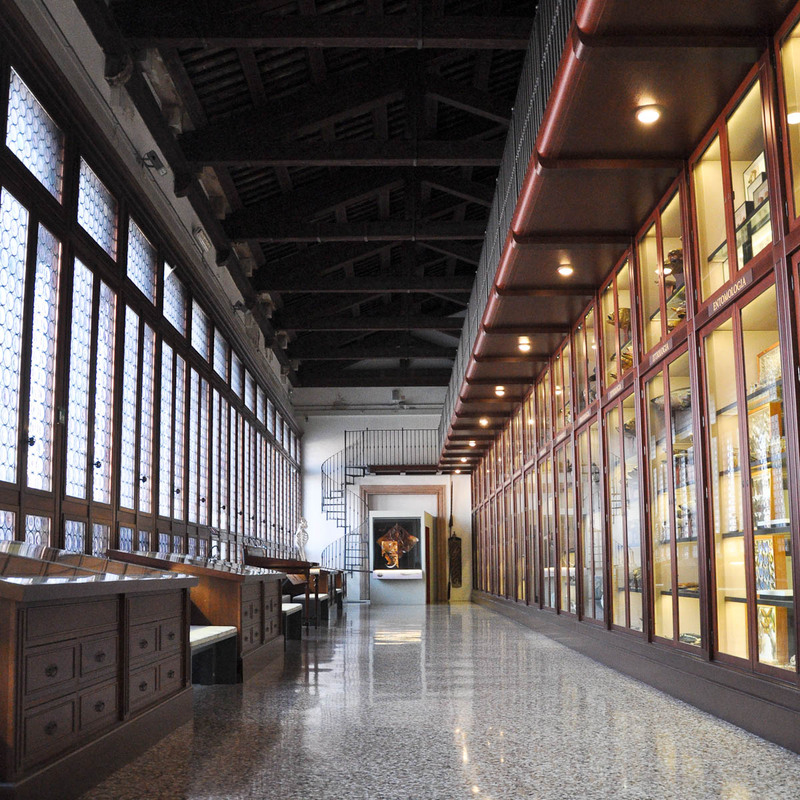 Especially, if you love interactive displays, well-organised museum itineraries and crave some freedom from the constant crowds which besiege Venice on a daily basis. Or, if you are travelling in the company of an inquisitive child who enjoys learning new things and is already tired of being dragged from one historical place in Venice to another. 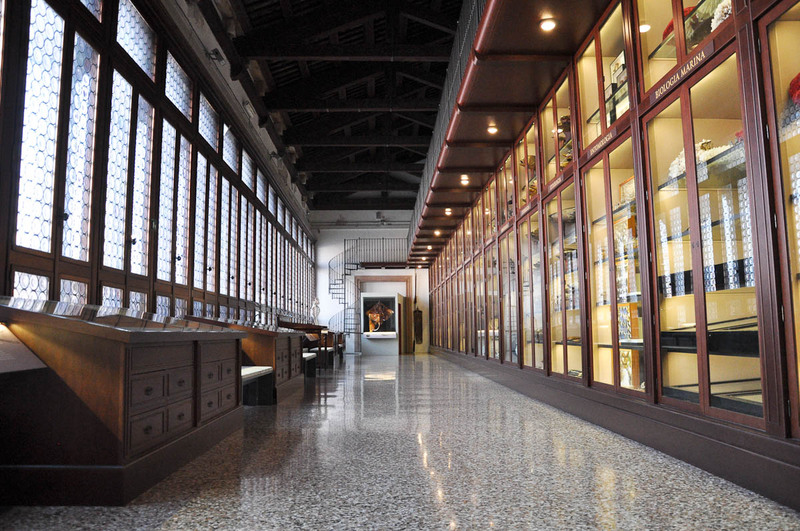 The Natural History Museum is located in what once was a lavish palazzo on the Grand Canal and it is only a short walk away from the train station Santa Lucia. Once you cross the imposing Bridge of the Barefoot Monks (Ponte degli Scalzi) right in front of the station, a brisk 10-minute walk through a maze of narrow curving streets will take you right there. There are signs pointing you in the right direction all the way through, but I also used the Maps app on my phone, as I am notoriously bad when trying to find a place I have never been to before. In fact, I did get lost at my first attempt to reach the museum, taking a street to the left instead of continuing straight ahead at one point, so I retraced my steps and tried again, this time successfully reaching my destination. Just a word of caution if you are pushing a buggy – apart from the Bridge of the Barefoot Monks (which is easy to navigate as its steps are deep and low) – there are a number of smaller and steeper bridges over small canals on the way there, so you will have to carry the buggy up and down on several occasions. I have found that there is always a gentle soul who would offer to help you, but just in case this doesn’t happen, prepare yourself in advance by taking a light folding buggy to ease your progress through the city. The Natural History Museum has a nice little courtyard, which looks like a great place to take a short break in when the weather is nice. We were there on a sunny and almost warm day in December, so we stopped in the courtyard just long enough to admire a very large ginger cat which was fluffy and deserved a moment of admiration. and ending up with: was there a place where we could leave our jackets and the buggy – at which point we were directed to the cloakroom. So, the atmosphere was nice and relaxed, nothing like the pressurised environment in large museums where crowds of people are herded back and forth and everyone appears a bit stressed. We left our stuff in the cloakroom (which was unattended, but it felt safe) and were ready to explore. Just a quick side note – the museum rooms were nicely heated, so leaving our heavy coats in the cloakroom was a good idea, as it allowed us to enjoy the exhibits unburdened by hats, gloves and other winter paraphernalia. Also, if you are parent in need of a changing room, the museum has the facilities free of charge, which is great, considering that you need to pay 1.50 euros every time you use a changing room in a public toilet in Venice (which anyway are far and few between). The guard checked our tickets and pointed us to a wide staircase going two floors up where the entrance to the museum exhibition was located. We went up the steps. You could tell that the building was big and imposing. I later found out that it had been originally built in the 13th century and initially it was often used as a residence for visiting dignitaries. Most interestingly though, from the early 17th century to 1838 it served as home for the Ottoman Turks in Venice. All of them lived and traded there and the palazzo was known as a ‘one-building-ghetto’ (‘ghetto’ coincidentally being a word originating from the Venetian dialect). 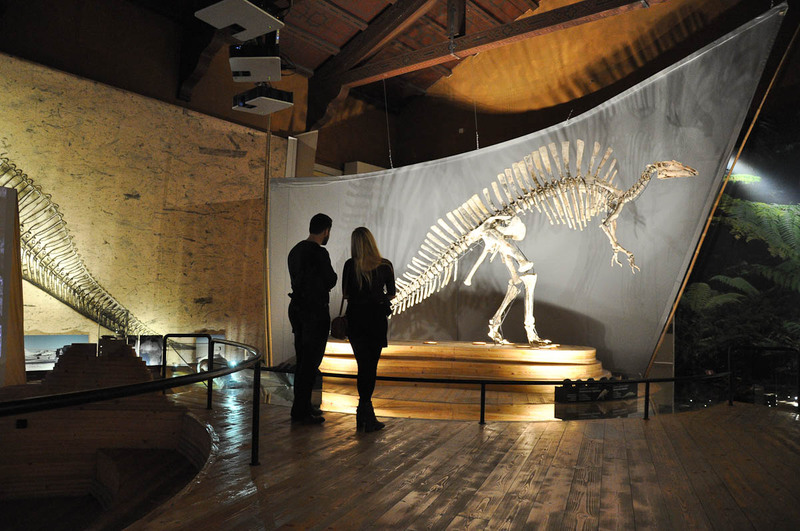 The Natural History Museum has been housed there since 1969. We reached the right floor and opened a simple brown door to find ourselves in a large room. 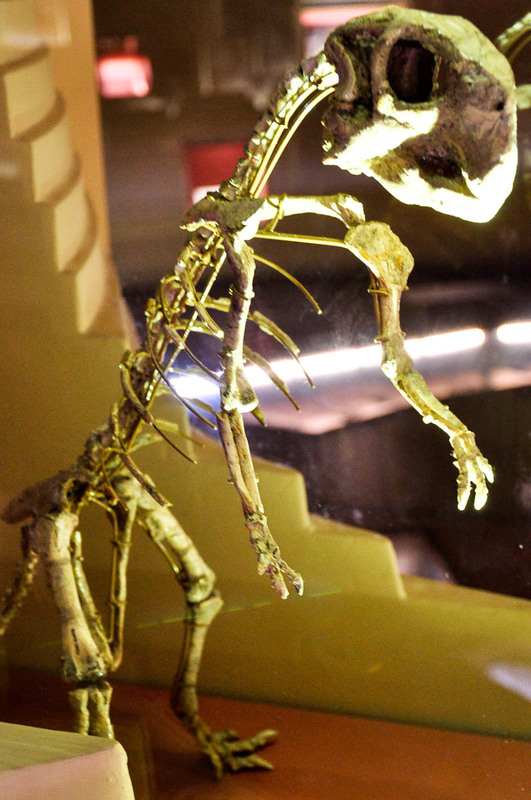 At one end of it stood the skeleton of a giant dinosaur. A big screen with a seating area in front of it took the centre of the room. A film about dinosaurs, scientific expeditions and mythical monsters in popular culture was being shown on loop on it. The lighting was mute and mysterious. All surfaces were covered with wood giving the room a very warm and authentic feel. My little daughter was excited to see the big dinosaur called Ouranosaurus Nigeriensis. I was bowled by the huge crocodile which lay in an exhibit at the feet of the dinosaur. 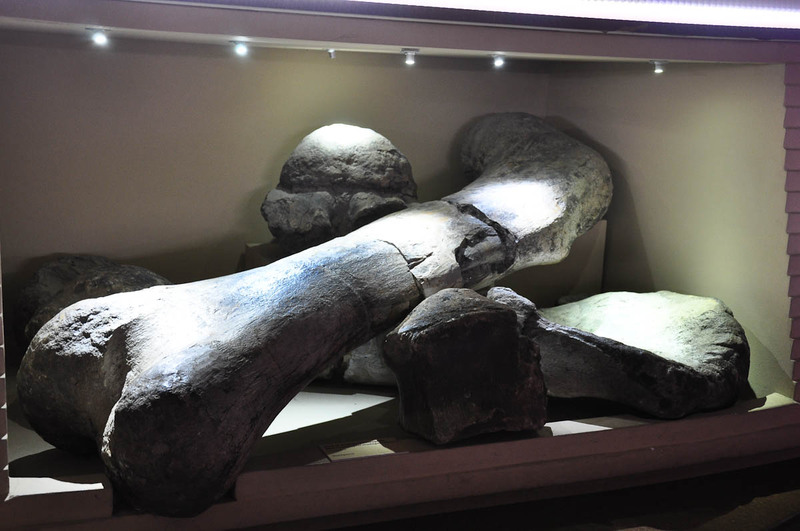 Apparently both were found in the sands of the Tenere Desert in the south central Sahara in Africa in 1973 during an expedition organised by the Venetian entrepreneur Giancarlo Ligabue. From there we followed the path deeper into the museum. 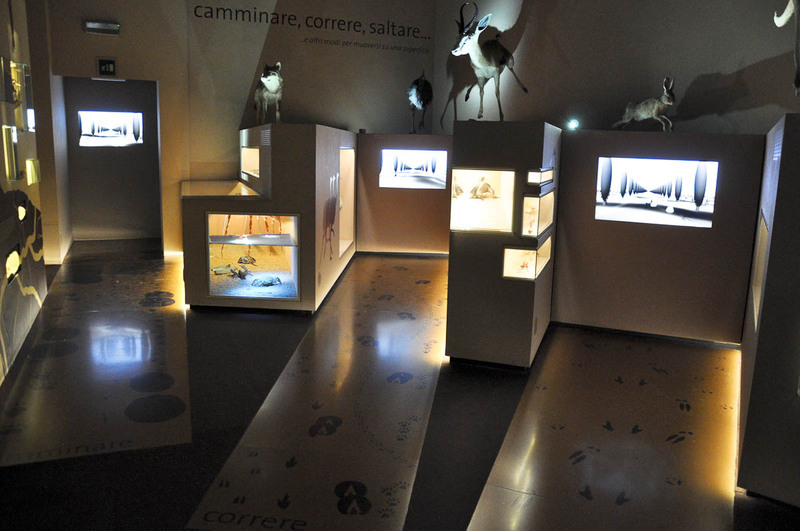 The exhibits were organised in logical itineraries – starting with several fossil rooms exploring different prehistoric eras, moving through the zone dedicated to Anthropology with a rich collection of tribal artifacts and hunting trophies and concluding with an area which illustrated the strategies of life or, in other words, how life has adapted to different environments like air and water and how the living organisms move and feed in them to ensure their survival. The progression from room to room was well structured and with every exhibit I felt like my knowledge and my understanding of the world around us grew. The exhibits also engaged all senses. This was not an old-fashioned museum where you only look at artifacts safely ensconced behind thick glass displays. 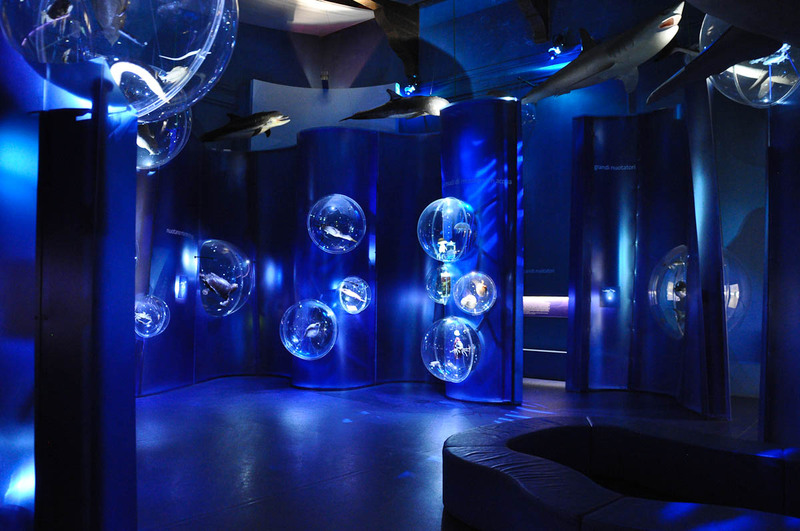 Instead coloured light emphasised the different exhibits, a well-thought soundtrack created a feeling of anticipation and mystery, plus in several rooms we could touch several different objects, like fossils and teeth, giving us an ever better concept of the subject explored. 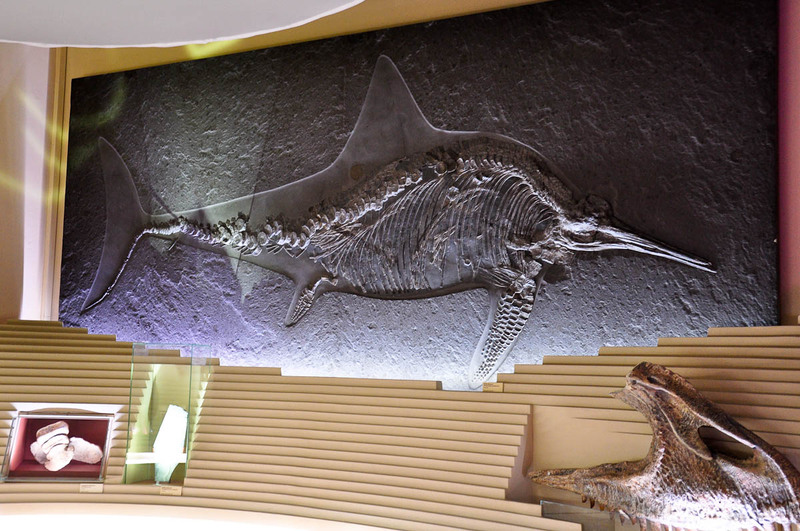 Glass displays, especially in the fossil rooms, were not confined just to the walls. 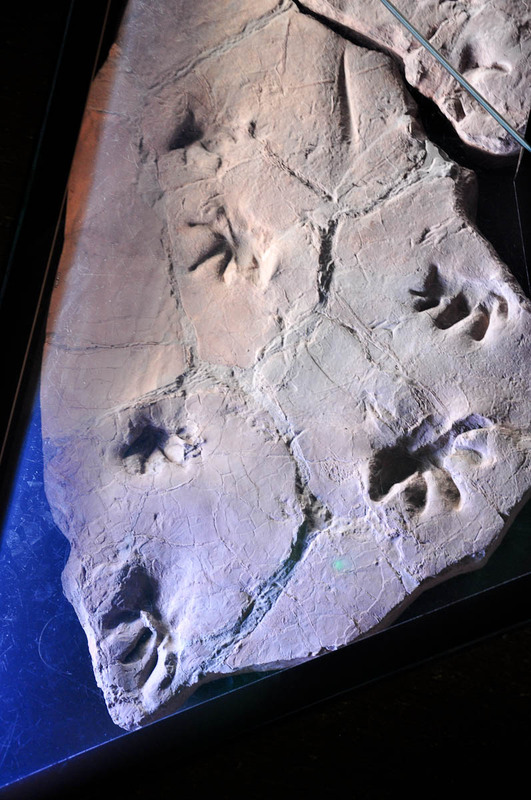 Instead, several of them containing fossils of animal tracks were built in the floor. 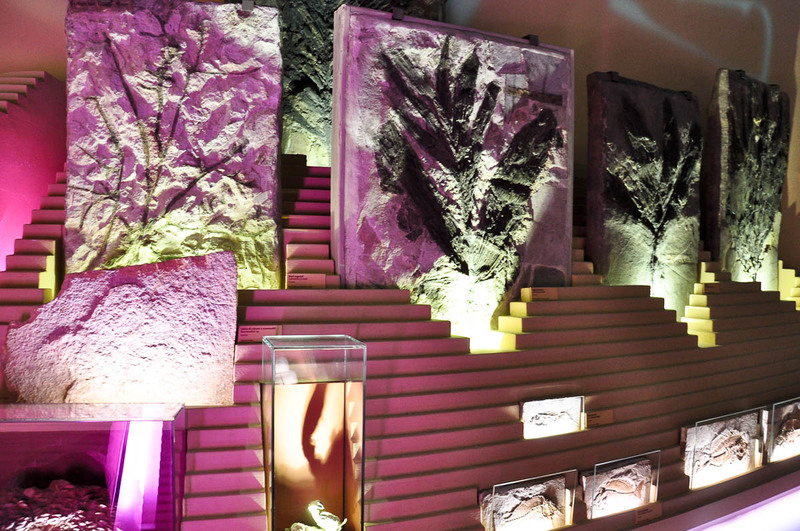 The displays had organic shapes, soft and wavy, making you want to touch them and follow their outline with your hand. Large circular screens were hanging from the ceilings. 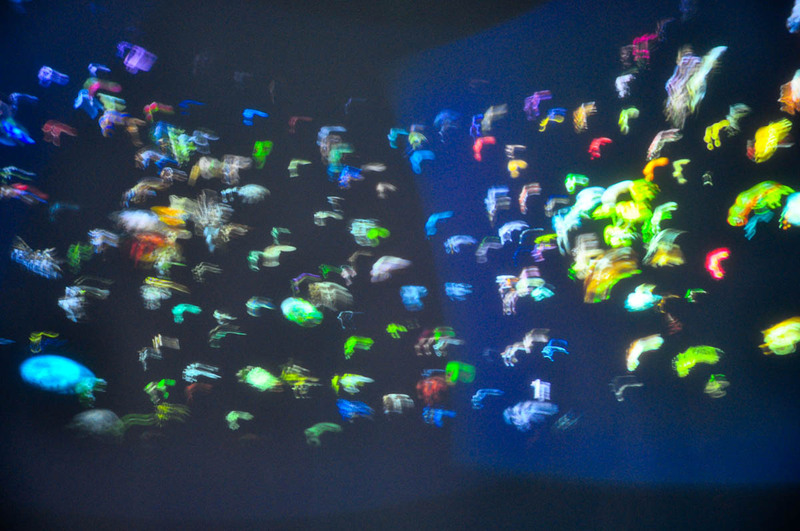 On them a light show was played on loop. 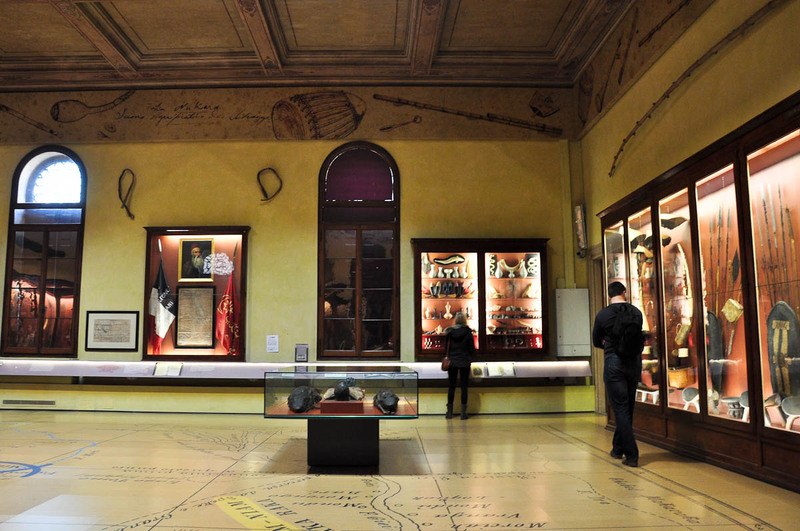 The next section – Anthropology – was a bit more restrained in its approach, with its wealth of tribal artifacts, adornments and arms neatly organised in large glass displays in a splendid room. Here, in a glass trunk was the mummy which the kind lady in the ticket office had warned me about. I had a quick glance from afar and could see the mummy flanked by two mummified crocodiles. I gently guided my little daughter forward, giving the glass trunk a wide berth. Later, I was told that older kids had loved seeing the mummy, so, maybe in a few years time, we can give it another try. Then and there, I thought it was better to concentrate on other stuff. 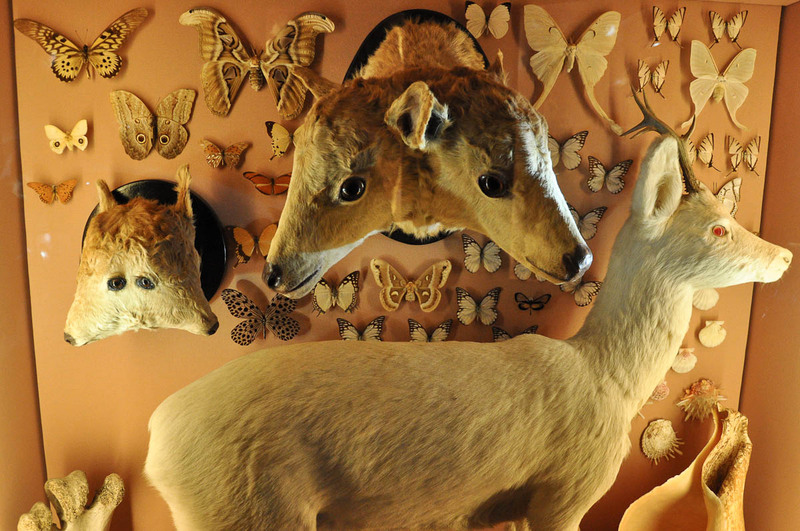 The collection of hunting trophies in the next rooms was the stuff my nightmares are made of. 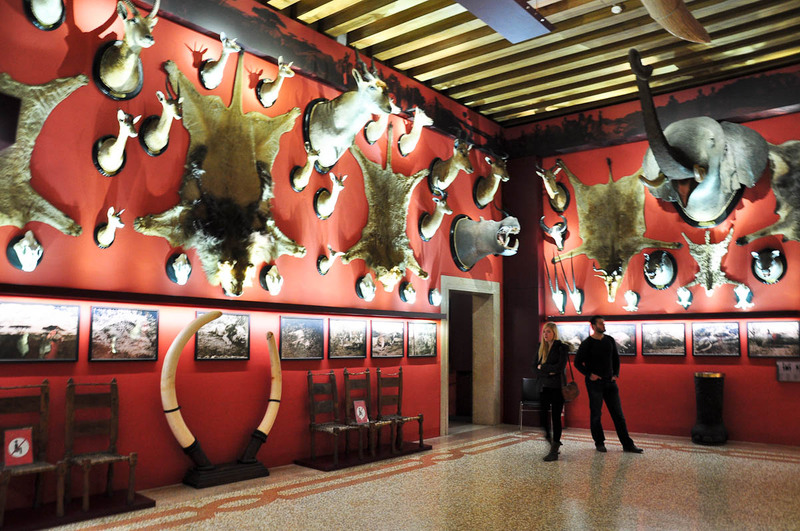 Heads and skins of animals – from lions to elephants – were hanging from the walls. Heck, there was even a couple of giraffe heads there, still on their long necks. The room was painted red and its thick curtains were drawn close, so to me it felt suffocating and scary. I need to point out that these hunting trophies were over a hundred years old, so it was good to know that public opinion on big game hunting has changed dramatically over the years. We stopped for a minute in the next room to chat to the affable museum worker there. 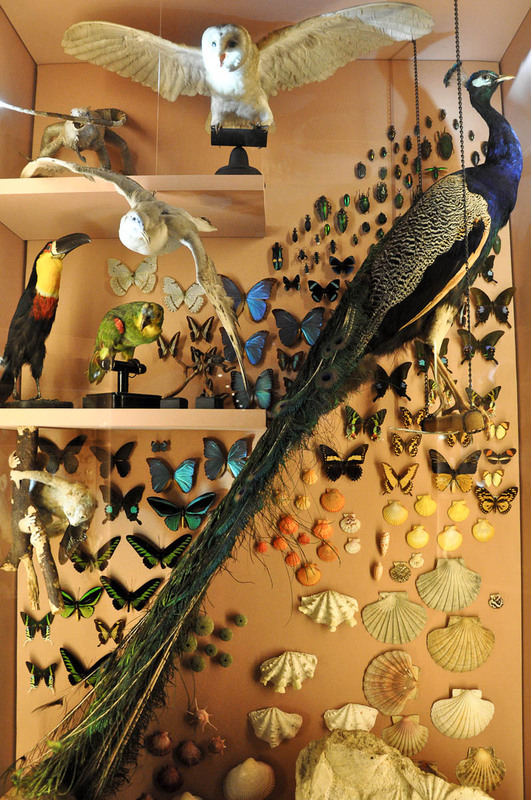 He told us that the exhibits had come from private collections of Venetians explorers and adventurers and that nowadays the Natural History Museum in Venice owns over two million objects. From there we walked into the stunning Room of Wonders – with full-size bulls-eye windows facing the Grand Canal on one side and a huge cabinet of curiosities running all the way on the other. There were some amazing collections there. 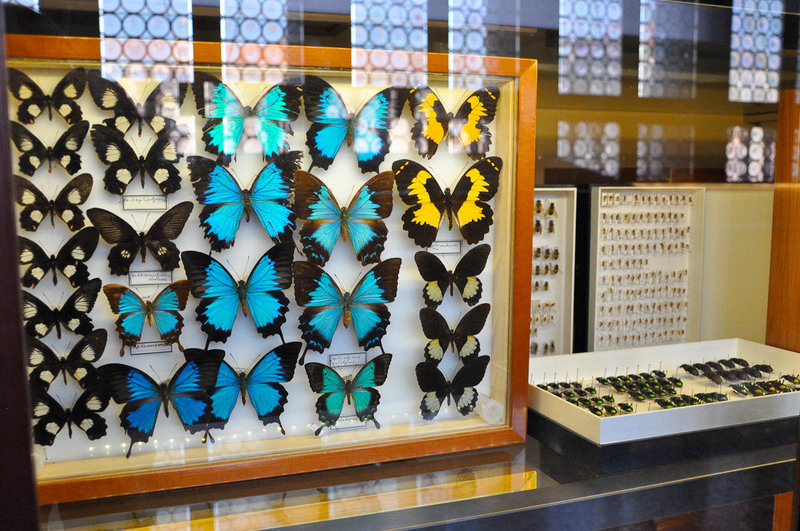 Like these butterflies and beetles neatly pinned to their displays. It was almost too much to take it all in. All these objects collected and painstakingly classified to nourish and further human knowledge. Straight after the Room of Wonders and hidden behind thick curtains lay an interactive chamber. On the walls around you a constant stream of animals slowly moved around. You controlled the display from a station in the middle of the room, choosing different topics to explore on the walls. For example, ‘the food chain’. This was the room my little daughter loved the most in the museum. The combination of colours, music and animals was too magical for her to resist, so we spent a long time there. 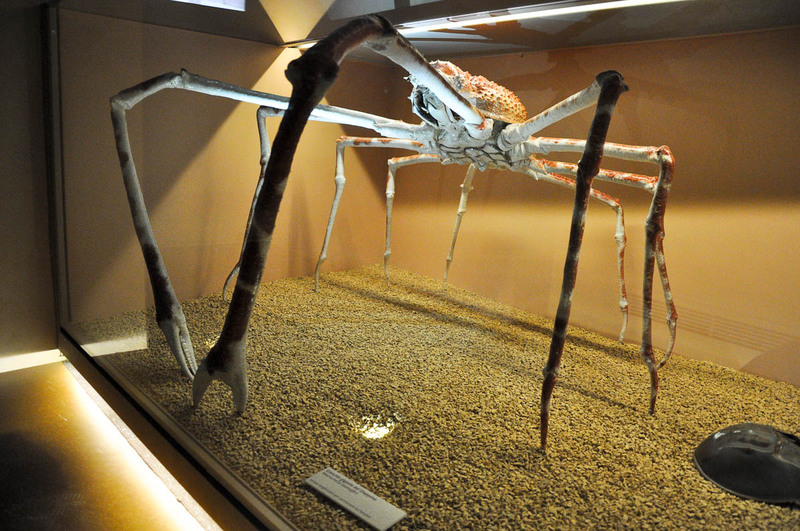 After that we explored the exhibition dedicated to how animals have adapted to their respective environments – from the sedentary corals to the moving mammals, reptiles and crustaceans. You could see on large screens the perspective of a moving animal and choose which animal to follow by stepping on its tracks on special interactive paths on the floor. At this point it was starting to get a little too much for my little daughter, so I scooped her up and walked a bit faster through the final rooms dedicated to life and movement in the water, in the air and on the ground. 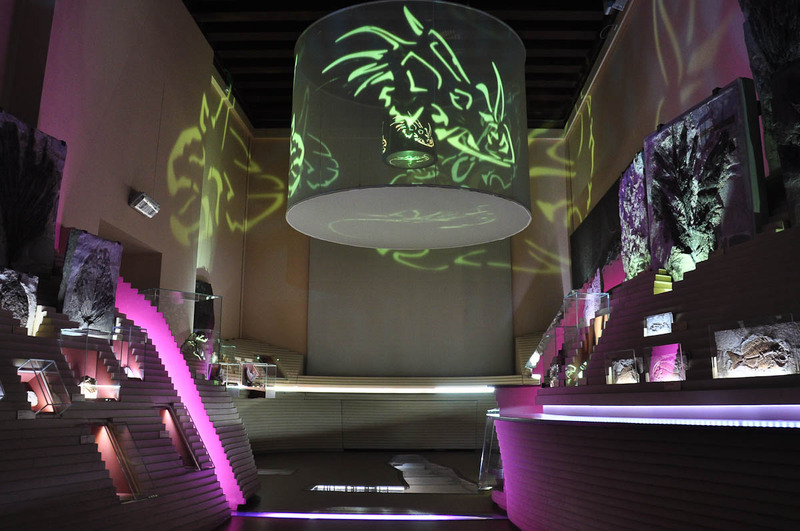 Then, we had a quick look at the aquarium on the ground floor where the tegnue or, in other words, the rocky outcrops in the western area of the Venetian Gulf, is recreated. After that, it was time to leave. We picked our stuff, said good-bye to the guard and the lady in the ticket office and headed out to explore Venice a bit more. 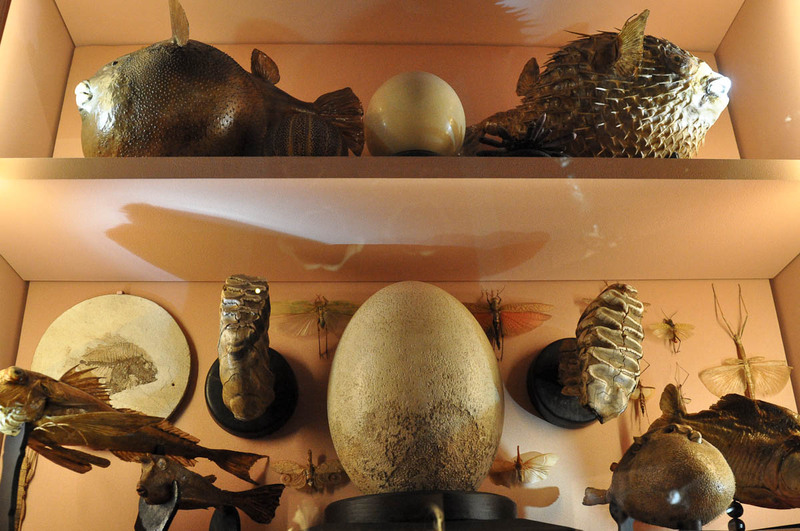 If you ever have a spare hour or two in Venice, give its Natural History Museum a try. I found it a great place to be, with a very good, logically organised collection with lots of interactive areas and, quite importantly, our visit was relaxed, unhurried and we could spend as much time as we wanted at every exhibit which caught our eye and our interest, which made for a great experience. Thanks for this recommendation! I will be in Venice this October for 5 days with 3 children aged 6 – 11. Do you have any further recommendations for children, please? And do you know of any tried and tested playgrounds (swings etc)? Preferably in the Castello area, where we will be staying. I have looked on line, but have found little information. Thanks. Thank you for stopping by! I am currently working on a blog post about things for kids to do in Venice. I am hoping to have it online within a month or two at the most. It really depends on what your children are interested in, but off the top of my head, I would suggest going to Rialto´s fish market early in the morning to see all the amazing fish they sell there, taking a traghetto across the Grand Canal, seeing a glass demonstration on the island of Murano, taking them to the Ships Pavillion to see the boats and gondolas exhibited there, attending a make your own mask class, going to the kids´event on Sunday afternoon at the Guggenheim Museum. There will be more suggestions in my blog post, I am still working on the information I have collected. With regards to playgrounds, I don´t know of any in Castello, but I can ask around. Best wishes!